The QX-102 Capsules are used for imaging various wet materials and biological samples, such as liquid samples (foods, cosmetics, oils, paints, etc. ), particles in solutions, adherent and non-adherent human and animal cells, and microorganisms. The samples can be visualized either directly or by following appropriate contrast enhancement staining or labeling procedures. The capsule serves as a cell culture dish, specifically designed for the SEM . No coating or embedding of the sample are required, enabling electron microscopy imaging with easy sample preparation comparable to light microscopy. The QX-102 Capsules are supplied sterile for single use in boxes of 24. The Multi-well Plate is designed to enable parallel handling of multiple QX-102 Capsules. It serves as a well plate for holding the capsules during various manipulations, for culturing cells in QX-102 Capsules, and for inspection in an inverted light microscope. The Multi-well Plate is specially designed to maintain humidity of the samples during incubation, and is compatible with standard laboratory equipment. The Multi-well Plates are supplied sterile for single use in boxes of 2. The Multi-well Aspirator system is designed to safely and conveniently aspirate liquids from the QX-102 capsules, and is required for applications that need liquid exchange in capsules during sample preparation or cell culturing. The multi-well aspirator drains liquids simultaneously from up to four capsules placed in a row in the MP-10 Multi-well Plate. The QX Aspirator Tips are used to safely and conveniently aspirate liquids from an individual QX-102 capsule with a pipette. The tips fit on any standard pipette, and are designed to ensure safe liquid removal. In cases where multiple capsules will be used or multiple liquid exchanges are required, it is recommended to use the MA-4 Multi-well Aspirator, which drains liquids simultaneously from multiple capsules. The QX Aspirator Tips are supplied sterile in boxes of 60. QX Imaging Buffer is a solution optimized for imaging samples in an SEM with QX-102 capsules and is formulated to minimize damage to the samples by the electron beam. It is applied on samples in the QX-102 capsules prior to SEM imaging. The QX Imaging Buffer is supplied sterile and lyophilized. The QX-102 Calibration Capsule is a QX-102 Capsule that has been specially designed to assist first time users in finding optimal imaging conditions for WETSEM® imaging in their SEM . The Calibration Capsule contains nanoparticles of two different sizes; 40 and 500 nm. The particles are easily visualized in an SEM and provide a convenient means to calibrate the parameters for optimal wet imaging conditions. When imaging particles with WETSEM® Technology, image quality is dependent on the proximity of the particles to the QX-capsule membrane. The closer the particles are, the higher the resolution. Coating the membrane with a suitable charged polymer will attract particles to the membrane and improve the resulting image. The particle imaging kit provides the WETSEM® Technology user with the tools and reagents necessary to coat the QX-capsule membrane. Poly-L-Lysine is a positively charged polymer which will attract negatively charged particles. Poly [sodium 4-sulfonate] ( PSS ) is a negatively charged polymer which will attract positively charged particles. Aspirator tips are designed to safely aspirate the QX-102 capsules, without damaging the capsule membrane. Aspirator tip should be used with a standard calibrated pipette to aspirate liquids from the QX capsule liquid dish. To apply liquids into the liquid dish use conventional tips. The supplied distilled water is used to wash the membrane from residual reagents. The SK-102-24 Starter Kit includes QX-102 Capsules and all the necessary accessories to get started with the QuantomiX WETSEM® technology. The SP-102-24 Starter Package includes QX-102 Capsules and all the necessary accessories to get started with the QuantomiX WETSEM® technology, when minimal liquid aspiration is required. It is recommended to add the Particle Imaging Kit to enhance particle imaging. QX-202 capsules are used for in-situ SEM imaging of various dynamic hydration processes. They can be used for imaging the hydration process of cement, gypsum and other materials. The unique design of the QX-202 capsules allows extended studies to be performed inside the SEM vacuum chamber - the dynamic process can be followed for up to 24 hours, removing the need for multiple-sample imaging or repetitive venting of the SEM. There is no need for coating, drying or freezing of the samples. Simply place the sample in the capsule, seal it and image. The samples can be visualized directly using a BSE detector. The QX-202 capsules are intended for single use and are supplied in boxes of 24 units. The Multi-capsule Plate is designed to enable parallel handling of a number of individual QX-202 capsules. It serves for holding the capsules during specimen preparation, and for storage. QX Imaging Buffer is a solution optimized for imaging the Calibration Capsule in an SEM. It should be applied into the Calibration Capsule prior to SEM imaging. The QX Imaging Buffer is supplied lyophilized. The Calibration Capsule is a capsule that has been specially designed to assist first time users in finding optimal imaging conditions for WETSEM® imaging in their SEM. The Calibration Capsule contains nanoparticles of two different sizes; 40 and 500 nm. The particles are easily visualized in an SEM and provide a convenient means to calibrate the parameters for optimal wet imaging conditions. Gilson Microman® pipette is specially designed to accurately displace small quantities of viscous solutions and mixtures. Also supplied is a box of single-use capillaries and pistons which are used in conjunction with the Microman M25. The SK-202-24 Starter Kit includes QX-202 Capsules and all the accessories necessary to get started with the QuantomiX WETSEM® technology. The QX-302 Capsules are used for imaging various thick, non-adherent samples, such as tissue biopsies, plants and material specimens, in their natural wet state. The capsule is suitable for variable sample sizes, with a maximum diameter of 3mm and thickness of up to 1mm. No coating or embedding of the sample are required, enabling electron microscopy imaging with easy sample preparation comparable to light microscopy. The QX-302 Capsules are supplied sterile for single use in boxes of 6. The Multi-capsule Plate is designed to enable parallel handling of a number of individual QX-302 Capsules. It serves for holding the capsules during specimen preparation, and for storage. 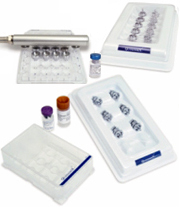 The Multi-capsule Plates are supplied sterile and intended for single use. QX-302 Imaging Buffer is a solution optimized for imaging samples in an SEM with QX-302 capsules and is formulated to minimize damage to the samples by the electron beam. It is applied on samples in the QX-302 capsules prior to SEM imaging. The QX-302 Imaging Buffer includes spacers that are used during sample preparation. The QX-302 Imaging Buffer is supplied sterile and lyophilized. The QX-302 Calibration Capsule is a QX-302 Capsule that has been specially designed to assist first time users in finding optimal imaging conditions for WETSEM® imaging in their SEM . The Calibration Capsule contains nanoparticles of two different sizes; 40 and 500 nm. The particles are easily visualized in an SEM and provide a convenient means to calibrate the parameters for optimal wet imaging conditions. For large quantities please contact us for special volume discounts. The SK-302-12 Starter Kit includes QX-302 Capsules and all the necessary accessories to get started with the QuantomiX WETSEM® technology. The SK-102-302 Starter Kit includes QX-102 Capsules and QX-302 Capsules, and all the necessary accessories to get started with the QuantomiX WETSEM® technology for all types of samples.